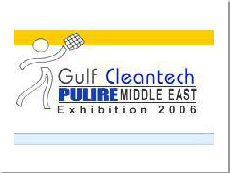 INTERCARE Group of Companies participatED in "Gulf Cleantech 2006", at Dubai World Trade Center, Stands 301, 302, 303 - Hall 5 from Sunday 12th February to Tuesday 14th February 2006. State-Of-The Art Cleaning machines from Taski, Truvox, Sweepers from Dulevo & Comac and Intercare Pressure Washers. Washroom Hygiene Products from SCA Hygiene, Kennedy, Steiner, ANDA, Waterbury Inc., and many others. A variety of Janitorial Products from Glit, 3M & Filmop will be exhibiting a range of cleaning accessories. Introducing the new Intercare “Microfibre” cleaning system & “Stonecare” marble & granite treatment products. Cleaning Chemicals from Intercare, which are both ISO 9000/2000 certified & GCC licensed, as well a the range of Taski Chemicals from Johnson Diversey.